It would be fairly easy to refer to The Gingerbread House by using the commonplace of the emotional journey implied by any attempt to delve into the family past. At the same time, the subtle presence of common ideas provides an author’s work with freshness when it comes to dealing with the issue of going home and the account by clan members who miss the same imaginary place. What originally looks like an eccentric, sensitive, melancholy proposal -with two youths at that intermediate age when they are no longer children or teenagers, the everyday moments when their anguish and uncertainty appear to combine in the face of what it means to grow up, originates in the author's necessarily Freudian interpretation. turning to fairy stories, perhaps the first source where any child learns to interpret his emotions, Roberto M. Tondopó found the best way of explaining this transition in the subjects portrayed: from childhood to puberty, from puberty to adolescence and from adolescence to maturity. The Gingerbread House conceived by the Brothers Grimm enabled the photographer to recreate the space and search for identity of these two children who are important to him not only because their respective ages remind him of a lost personal era and one he wishes to recover but also and above all because they are his niece and nephew. They are the ones who will have to set off on the journey home that will force them to face adversity, cooperate with each other to save themselves and understand their uncontrollable impulse to destroy what protects them. In these photos, we look over our shoulders at the past from the present and vice versa. That is why Andrea and Ángel’s childhood and adolescence, the period when they experienced noticeable bodily changes associated with the Marfan syndrome, turned into an autobiographical bridge: that flashback led the photographer to explore who he was, what environment surrounded him at the time, and what soundtracks he listened to while he was growing up, in a mixture of confusion, nostalgia and chaos and in a state of perplexity. Just as love only exists when it has passed rather than in the present, the recognition of our pockmarked faces can only be understood in perspective. 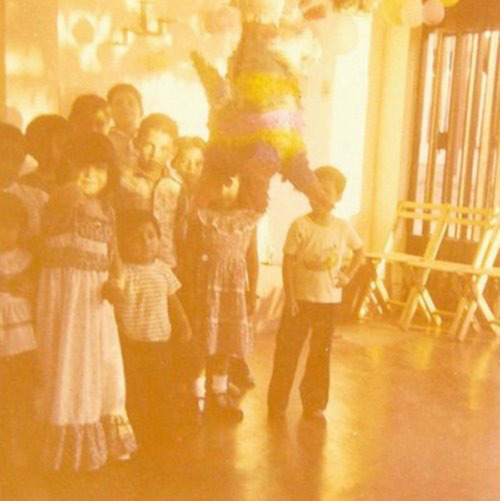 This explains why some of the photographs in this series are surrounded by objects that appear to have remained intact without being exactly the same: the piñata is different but symbolizes the destruction of childhood. And this range of colors, the atmosphere, the ritual of celebration, memories and the echo of its first intensity means that objects will emerge from memory to the surface while remaining suspended in time. The coincidence between the niece and nephew’s ages and those of the author and his siblings in the photographs in their family album also explain why there is “something” of the photographer in the characters he explores. Roberto Tondopó examines the main faces that have constructed his own through the family tree of features and the family histories that are kept alive in every gesture and circumstance of the present. That is why some of the photos appear to have been taken in the past. They have a home-made, vintage feel that recalls spontaneous photography, Kodak moments that make it possible to create the fiction in the family album. In recent years, retro has become extremely popular. The past has become fashionable, as a way of admitting that what is new will always be old. Although the gingerbread house reflects this type of search, it has other features, some rather disturbing, since it shines light on the claustrophobic density of the domestic setting and its hidden meanings since it emphasizes the emotions and sensations that were thought to be lost but remain as silent vestiges in the present. The microcosm portrayed is not only a nostalgic account and cannot only be explained by his desire to re-invent yesterday’s clichés: several scenes stripped of the past-present anchor possess the strength of open narrative events, where the image suggests that a story is about to happen or has already happened. And it is at this level that the main characters in the series -Andrea and Ángel- enhance the quality of the fiction in the photos: fragile, disturbed and temperamental, they express their stupor in a dramatic, amusing fashion. Playing at something dark and persistent, they highlight the beauty of their age through the apathy with which they move. They imbue the atmosphere with chaos, irradiating health and evil. They are as light as the air and as surrealistic as a dream. In the end, they express the overwhelming energy of their bodies as well as the imbalance of being at an age where nothing is defined. It is up to them to discover the extraordinary in the ordinary, the sinister nuances and hidden truths that we know exist in family bonds. A document on aesthetics and inheritance, memory and fiction, The Gingerbread House uses images with narrative force that reveal the photographer’s taste for subtle details, intention and chance and the constant succession of situations ranging from extravagance to melancholy, comedy to confusion. It uses a bittersweet approach to highlight the inevitable road to maturity that involves abandoning Hansel and Gretel forever. Their refusal to grow is so great that they abandon the house in order to find out for themselves that there is a point in life when there is no return, even though it is precisely this point that must be reached, as Kafka said, because otherwise there are no pretexts for starting back.